Using an iPad, Trump said, he showed Kim a short video made on his behalf, laying out the opportunities that could come with an agreement to eliminate North Korea's nuclear arsenal — a story about "two men, two leaders, one destiny." Reminiscent of a movie trailer, the film shows images of warplanes and artillery while a narrator suggests in English and Korean that "a new world can begin today, one of friendship, respect and goodwill." "We had it made up. I showed it to him today, actually during the meeting, toward the end of the meeting and I think he loved it," Trump said during a news conference. The video was broadcast on big screens at the start of Tuesday's press conference. Trump said the video was played for about eight members of the North Korean delegation, "and I thought they were fascinated by it." The president added: "That could very well be the future." "I showed it because I really want him to do something," he said. 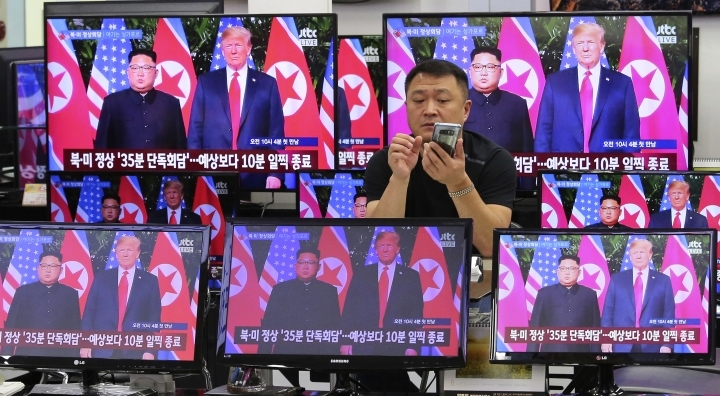 Long an authoritarian state, North Korea has used propaganda films to shape public perception of its leaders, often portraying Kim and his family as gods. The current leader's father, Kim Jong Il, was a longtime movie buff who had thousands of titles in his film collection and once led North Korea's ministry of propaganda. Trump, who starred on NBC's reality show "The Apprentice" before entering politics, told reporters he was "not concerned at all" that the film could be used as propaganda, adding, "We could use that video for other countries." It wasn't the first time video was used as a way to connect with Kim. At the end of a summit in April on the southern side of the Demilitarized Zone between the Koreas, Kim and South Korean President Moon Jae-in watched a highly produced video, backed by inspirational music, that highlighted the ceremonies they had just conducted during the day. During his exchanges with Trump, Kim seemed to buy into the cinematography of their unlikely meeting, saying through a translator, "many people in the world that will think of this as a scene from a ... science fiction movie." Against a piercing musical score, the narrator dramatically asks, "What if? Can history be changed? Will the world embrace this change? And when can this moment in history begin? It comes down to a choice, on this day, in this time, at this moment, the world will be watching, listening, anticipating, hoping." The video suggests that Kim could "be the hero of his people. Will he shake the hand of peace and enjoy prosperity like he has never seen, a great life, or more isolation? Which path will be chosen?" 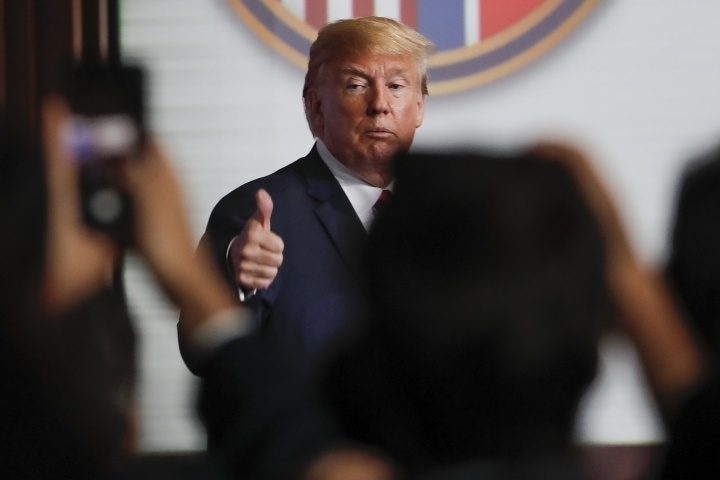 The narrator references some of Trump's main arguments to Kim, namely that eliminating his nuclear stockpile would allow his country to benefit economically and re-enter the world community. The trailer portrays Trump and Kim as the two leading characters of the film — but the outcome is yet unknown. 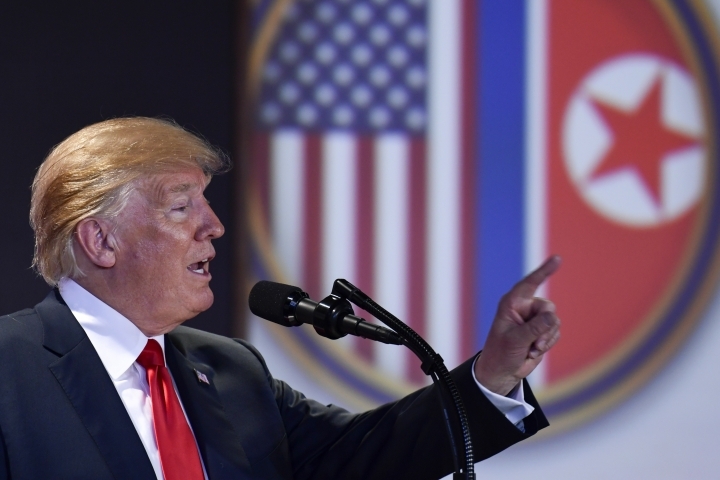 The narrator says the film is "featuring President Donald Trump and Chairman Kim Jong Un, in a meeting to remake history, to shine in the sun, one moment, one choice, what if? The future remains to be written." Associated Press writers Jill Colvin and Darlene Superville in Washington and Foster Klug in Singapore contributed to this report.